Conductor and pedagogue Max Rudolf exercised an influence over American musical life matched by few other musicians of the twentieth century. After learning his craft in Europe, Rudolf came to the United States and became not only an important conductor at the Metropolitan Opera, but also an assistant and advisor to general manager Rudolf Bing. His counsel seems to have held considerable sway with Bing and he was very active in shaping the direction of America's premier opera institution between 1950 and 1958. In 1950, Rudolf published The Grammar of Conducting, a book on conducting that became a standard text on the art and has maintained its primacy through several generations of budding orchestra leaders. At age seven, Rudolf began his musical training, achieving proficiency in organ, trumpet, cello, piano, and composition (the latter with Bernard Sekles) before he entered Frankfurt University and Conservatory. After initial interest in composition, Rudolf made his debut as a conductor at Freiburg in 1923 and thereafter concentrated on that discipline. Following a period at the Freiburg Stadtische Theater and at Darmstadt, he moved in 1929 to Prague where he spent six years as a principal conductor and assistant to the theater's music director, George Szell. A guest appearance with the Berlin Philharmonic came as the result of his growing reputation. The rise of National Socialism prompted Rudolf to move to Sweden in 1935, where he spent five years in G�teborg, guest conducting the city's orchestra and the Swedish Radio Orchestra. In 1940, Rudolf emigrated to the United States, finding, among other engagements, a teaching position at the Chicago's Central Y.M.C.A. College School of Music. His first appearance as an opera conductor in America came with the New Opera Company in New York in 1944. An invitation to become an assistant conductor at the Metropolitan Opera was extended in 1945 and Rudolf made his house debut in a January 13 gala the following year. Rudolf's first complete opera at the Met, a March 2 Rosenkavalier, was cited for the thoroughness of its preparation. In 1947, he was entrusted with the world premiere of Bernard Rogers' The Warrior, a competition-winning one-act work based upon the legend of Samson and Delilah. Although the performance won respectful reviews, the work was heard only once more. With the appointment of Bing to the Metropolitan Opera, Rudolf (a United States citizen since 1946) became an administrative assistant, remaining in the position until 1958 and mixing his duties in New York with guest-conducting appearances in America and Italy. In 1958, Rudolf was engaged as music director of the Cincinnati Symphony Orchestra, a post he held until 1970. 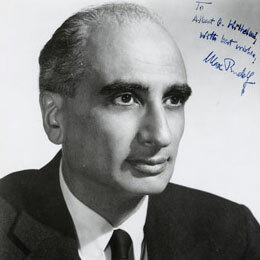 That year, Rudolf resigned from his directorship in Cincinnati to oversee the conducting and opera departments at Philadelphia's Curtis Institute. He held the position until 1973, when he left to conduct at Dallas and to return to the podium at the Metropolitan Opera. In 1981, Rudolf rejoined the faculty at the Curtis Institute, continuing there as an emeritus member until the time of his death. Eschewing the glamorous aspects of the conductor's life, Rudolf exemplified the melding of artistic integrity and technical understanding required of anyone aspiring to music administration. As a symphony conductor, he championed new works as well as conducting assured and stylistically aware performances of the standard repertory.